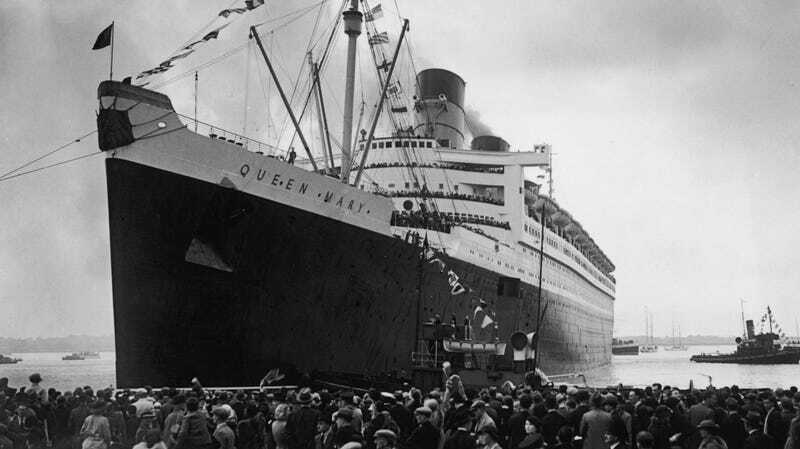 Queen Mary setting off on her maiden voyage in 1936. Doomed filmmakers not pictured. We can’t personally tell you the Queen Mary is haunted, but, having looked at its website, we can tell you that the Queen Mary would sure like you to think it’s haunted. The ocean liner, which operated as both a cruise ship and a transport ship for Allied troops during World War II from 1936 to 1967, currently operates as a hotel from its port in Long Beach, wearing Time’s naming of the vessel as one of 10 most haunted places in America like a badge of honor. Ghost tours abound, with guides touting the investigations of the ship’s spirits by the TV ghost bros of Ghost Hunters and Ghost Adventures. There’s talk of screams and slamming doors. There’s been sightings of a ghost girl’s nightly game of hide and seek. There’s even the oh-so-cinematic tale of a “Woman In White” who dances to a “silent orchestra.” Will they play a role in Rocket Science’s new horror movie about the ship? Or perhaps a cameo? Because, per The Hollywood Reporter, producers are planning to film The Queen Mary movie on the ship itself. That sounds neat, but the gimmick serves only to mask the questionable talent behind the project. Gary Shore, who helmed the dire Dracula Untold in 2014, will direct the feature, and its producing team is currently swimming in the slew of Razzie nominations earned by last year’s lame-duck Winchester. Per THR, the movie will follow a pair of photographers and their young son who “unleash a series of events that entwines their family with the ship’s dark past.” If they’re lucky, maybe they’ll bump into the Queen Mary’s “resident ship para investigator” along the way.